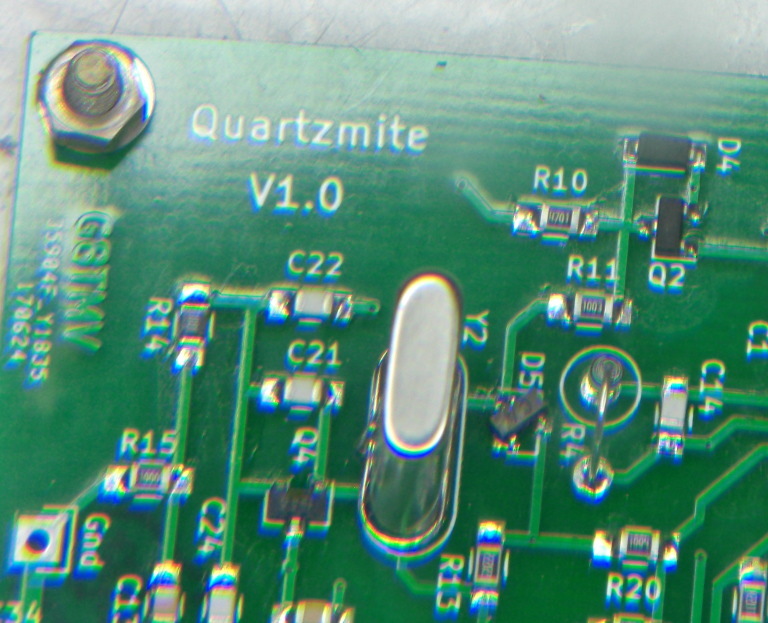 The Quartzmite project started when I decided to build a surface mount version of the popular 'Rockmite' QRPp CW transceiver. After talking with Dave Benson, K1SWL the original designer and Chuck Carpenter, W5USJ who did some efficiency modifications to the P.A. and low pass filter I came up with a variant of the circuit that uses nearly all SMT parts. As well as the improved Tx low pass filter my design makes use of the second op-amp in the LM1458 to implement a Sallen-Key second-order active low pass audio filter for the sidetone, making it sound much less harsh than the square wave of the original Rockmite. I've also put a pre-set pot in the sidetone circuit so the user can set the sidetone volume independantly of the Rx audio. Once the design was stable a printed circuit board was designed and sent out to be made. There are some images below. The prototype is built and testing is in progress, it is basically working. 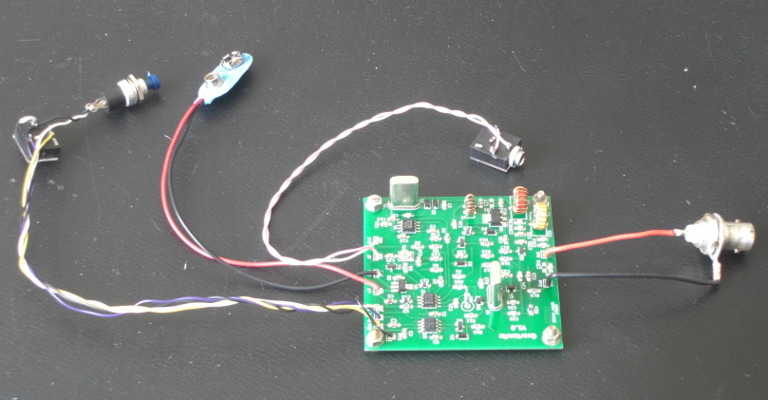 With a 9v supply it is delivering about 0.25 watts and with a 12v supply about 0.4 watts. With the 12v supply on Rx it draws about 15mA and on Tx about 150mA. Effort is currently focused on increasing the power output by adjusting things in the driver and PA part of the circuit to make them more efficient. One area that took some work was the 'shift' function that moves the local oscillator between two frequencies about 700Hz apart, this is used to separate the Rx and Tx frequencies. The original Rockmite design is rather basic in this area and it has proved impossible to get a sensible shift with any of the available zener diodes. After some experiments I decided that rather than use a single zener diode to generate a reference voltage and use ground (0v) for the other voltage, it was better to use two zeners with the lower voltage one switched by the FET. To do this on the prototype board I cut the track going to the drain of Q2 and inserted D7 between there and R10 where it just fits. As well as making it easier to get the required shift this has the additional benifit of allowing the use of the low end of the varicap capacitance range, which means we are pulling the crystal less and so the oscillator is more stable. The Rockmite design also pulls the crystal away from it's natural frequency in one direction all the time, this results in the shift being very non-linear. I may try adding a small inductor which will hopefully make the shift more balanced about the crystal natural frequency. The output waveform on a 'scope is a nice sine wave and my spectrum analyser measured the transmitter 2nd harmonic at -52dB so the low pass filter is performing as expected. 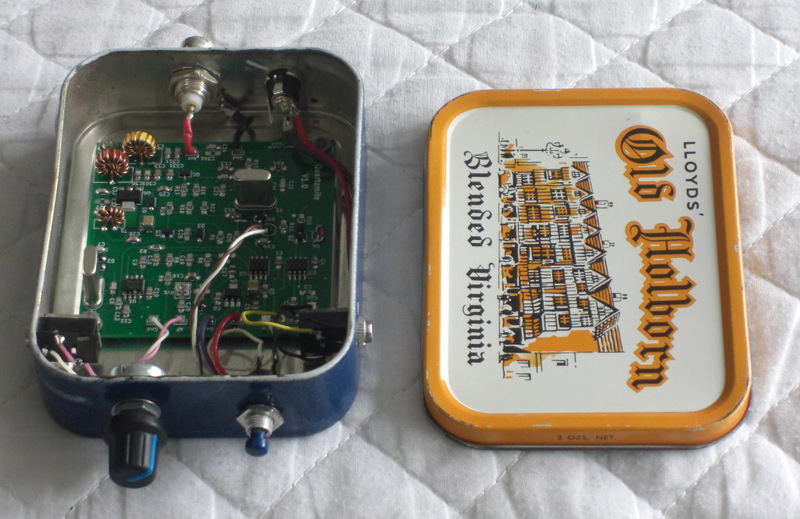 The last thing to do was to put it in an enclosure, I had a 2oz tobacco tin at the ready since the prototype board is slightly too big for an 'Altoids' tin. The revised board, however, is "Altoids friendly". The prototype installed in it's tobacco tin. A schematic is available here, a Bill of Materials here, and a set of construction notes here. The Quartzmite keyer is functionally identical to Dave Benson's original Rockmite keyer. A quick push of the control button reverses the Tx/Rx frequency shift. If a straight key with a mono plug is connected at power up then the iambic keyer is disabled and the rig operates in straight key mode. With paddles connected, pressing and holding the control button enters speed change mode where one paddle increases the speed and the other reduces it. Not actually a bug, but a limitation, C15 and C29 are across the supply so have to be rated for it. Unfortunately 0805 47uF caps only seem to be available as 10v max. It is possible to squeeze a 1210 cap onto the footprints which allows the use of 16v caps. The slight bodge required to fit D5, the varicap diode. A 3-D view of the PCB design.